The combination of PCR technology and hybridization with SSOPs was first applied to HLA class II typing[7,8] because of the limitations of DR serology and of the better knowledge of allelic polymorphism at DR/DQ loci. The procedure relies on the locus-specific amplification of the genomic DNA segment comprising the polymorphic sites of HLA alleles, exon 2 for HLA class II genes, and exons 2+3 for class I genes. 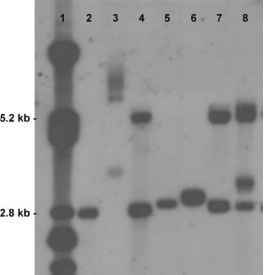 Amplified DNA is then immobilized on a solid support (dot blot), usually a nylon membrane, and then hybridized with a battery of SSOPs (direct hybridization). The higher the number of probes, the better is the resolution level. The method is well suited for large-scale typing, as many DNA samples can be tested in a single hybridization step, but it requires simultaneous hybridization with a large number of probes for which each melting temperature has to be optimized. Alternatively, probes are fixed on a solid support, a membrane, a microtiter tray, or microbeads, and a single DNA sample can by genotyped in a single hybridization step. Ideally suited for rapid HLA typing as required for clinical transplantation, the method has now been developed by a number of commercial companies that have automatized the hybridization/ washing/reading steps, thereby allowing high-throughput typing. Usually 50-100 probes per locus are used for intermediate/high-resolution typing.